Interactive work in taijiquan is typically referred to as “Push Hands”. There is a school of thought that would like this phrase to change to “Sensing Hands” to better reflect the less aggressive side of taiji interactive work. This is because many people attempt to train by touching hands, waiting to ‘sense’ what your partner is doing, and responding accordingly instead of being that attacker. What actually happens (lots of pushing instead of sensing) is another matter entirely :-). But allowing the emphasis to be on yielding and reading an opponent, rather than pushing can help a player focus on the relaxing and yielding energies taijiquan uses. Regardless - Always have fun pushing!! A recent, ongoing discussion on Facebook reminded us of the difference in schools of thought around this subject. On the Taijiquan “One Family” mission page, Daniel Pfister started the conversation with this post below. The ensuing conversation is interesting for all players. We’re posting some screen shots of the discussion that has arisen around this post. It’s worth taking some time to read through them. What do you agree with or not agree with? For those with little push hands experience, what is your understanding of taiji principles and the practice that you do. Are you able to think about interactions within your current practice? At one point push hands was known as striking hands. Some call it "sensing hands" so as to get away from the idea of a forceful push. Currently, I think the pushing, rather than yielding, needs to be our default mode in pushing hands. Thus it should remain true to its name. Pushing against your opponent will most quickly cause them to react in some way, then you can practice taking advantage of their reaction. Not pushing and/or constantly disengaging with the opponent provides less opportunity to learn how to move with them. Yielding is a basic technique to use when someone resists your push in an excessive way which unbalances them. But when that resistance isn't there, its a good idea to return to pushing into them in a deliberate way. The more skill you build, the less force you should need to use in your push to elicit a response that you can turn into an advantage. But being too light in the beginning just for the sake of being soft or "letting go" might slow down your progress. Whole conversation can be found here. Practice and the memory of "Ben Lo"
The text below was taken from the Facebook Page Taiijquan “One Family” Mission. Posted by Matt Stampe on Nov 8th, 2018. While it’s a little longer it is very worth the read. Especially for those of us who struggle with practice. While we don’t stand in postures for an hour as they did at one time, it’s good to be reminded that slow steady practice is what wins the race. You don’t have to be able to do every posture correctly before your practice is effective. It is with a focus on CORRECT practice that we improve. Ben Lo event this weekend (Nov 8th) in DC/VA/MD area: Wuwei T'ai Chi for announcing the November 10, 2018, 10 a.m. - 12:30 p.m. gathering honoring Master Ben Lo, starting at the Cabin John Park taijiquan court, and followed by lunch at a local restaurant. As has been noted on this forum, the great Lo Pang-jeng, known in the West as "Benjamin P. J. Lo", passed away peacefully in his home surrounded by long-time students and family on October 12th. Lo Laoshi was the first person to study with Professor Cheng Man-ch'ing after his relocation to Taiwan in 1949. In spite of his eventual and very impressive achievement in T'ai-chi Ch'uan, he first came to Professor Cheng for medical treatment, not for martial arts instruction. 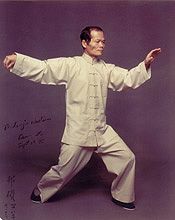 Due to Ben's serious physical illness, Professor Cheng advised him to take up the practice of T'ai-chi so that his body could gain enough strength to derive benefit from the herbal remedies that had been prescribed. Ben was not aware of the fact that Professor Cheng had been a martial arts master of great renown on the Mainland, and he was quite surprised to hear that his doctor would prescribe the art, much less offer to teach it. He asked somewhat incredulously, "You know T'ai-chi? " Professor responded in simplicity and in sincere humility, "Enough to teach you." With that, the young Ben Lo began his arduous course of study. Professor Cheng taught him in the traditional way. Ben was shown the first posture and instructed to "hold the posture" and relax...without moving...for one hour. Ben was not shown another posture until he could demonstrate the previous one to Professor' s satisfaction and hold it without moving and in accordance with the principles of T'ai-chi for one hour. When he had gotten as far as the posture Lifting Hands (T'i Shou), he stood in his teacher' s presence for a total of 120 hours holding that one posture. But Professor would not show him the next movement. He was only able to progress beyond this point in the form due to the intercession of Madame Cheng, who implored her husband in Ben's behalf. She said, "You cannot teach him so strictly as Master Yang taught you. Times are changing!" Professor' s response was, "Why should I show him another posture when he can't yet do this one properly. His leg is shaking like a pipa string!" Still, gradually, Ben made progress. Mr. Lo told me that for several years he only went three places: home, school, and Professor' s house. He would go to Professor Cheng's and practice for one hour in the morning and back again after school for one more hour of practice in the afternoon. Then he would go home and in his personal time "practice T'ai-chi" . He said that other young people his age, such as his school mates, went to social gatherings, saw movies, and so forth. Not Ben. He only attended to his school work and practiced T'ai-chi. In the beginning, his motivation was to save his life and regain his health. Later, he learned not to fear suffering but, rather, to invest in loss and to "eat bitter" . And as Ben endured the bitter training, not only did his health improve, but his gong-fu grew deeper and more profound. Ben eventually learned of his teacher' s fame, as many famous boxers came to visit and to pay their respects. Some came to test Professor Cheng's ability. In these cases, they had to first face Ben Lo. Few passed this initial test. As Mr. Robert W. Smith put it, "Ben was discouraging. " Yet, as his skill and reputation increased, he demonstrated that he had learned the lessons of wude as well as wushu. It is unusual in the world of martial arts for a person's substance to exceed his or her fame, but this is true of Mr. Lo. Although he is known and respected around the world, Mr. Lo remained sincerely humble and never demonstrated his skills just for the sake of showing off. When his close students asked why he didn't demonstrate more of his amazing abilities in public, Ben simply said, "Why use a quarter when a nickel will do." Mr.. Robert W. Smith referred to Mr. Lo in this way: "Modest man; true T'ai-chi. " I met Mr. Lo almost 40 years ago. Although he was my T'ai-chi "uncle" and not my primary teacher, he influenced my life and practice profoundly. I am deeply grateful for his kindness, his example, his instruction, and his patient and persistent correction. He inspired me again and again over the last four decades to continue practicing T'ai-chi, especially when my perseverance was wavering. He challenged me to deepen my practice when it's quality was found wanting, reminding me of the old Chinese saying, "Buy the best and cry once." When I lamented over all of the time I had lost by not practicing as diligently and correctly as I should have, he looked me in the eye and said, "Go ahead and cry. Then, dry your eyes and commit yourself to practice. Begin where you are and invest the time that you have. The better the quality of your practice, the greater the return on your investment of time and energy." I have never trained so diligently as when I was under Mr. Lo's watchful eye. In addition to setting a high standard of practice in the West and blessing us with excellent instruction, Lo Laoshi also contributed to our T'ai-chi community in other ways. In particular, we must thank him for his excellent translations of several key texts: Professor Cheng's masterpiece (Cheng Tzu's Thirteen Treatises on T'ai Chi Ch'uan, North Atlantic, 1985), the T'ai-chi Classics (The Essence of T'ai Chi Ch'uan: The Literary Tradition, 1979, revised in 2008, IRI Press), and Chen Wei-ming' s T'ai Chi Ch'uan Ta Wen (Questions and Answers on T'ai Chi Ch'uan, North Atlantic,1985) . For more information on Ben Lo, please see the excellent article by Larry Mann and Don Davis, "Conservator of the Classics: An Interview with Benjamin Pang-jeng Lo", published in the Journal of Asian Martial Arts, Volume 5, No. 4, pp. 46-67 and reprinted in the anthology entitled Cheng Man-ch'ing and T'ai Chi: Echos in the Hall of Happiness, Via Media Publishing, 2015. See also the comments of Mr. Robert W. Smith on Ben Lo, particularly in his final book, Martial Musings: A Portrayal of Martial Arts in the 20th Century, Via Media Publishing, 1999, pp. 294-303, etc.. I also had the honor of working with Mr. Lo on his articles memorializing his classmates and friends Robert W. Smith and Liu Hsi-heng. The first, entitled "In Memory of our American Tai Chi brother, Robert W. Smith", was published in T'ai Chi, Marvin Smalheiser&# 39;s quarterly magazine, Volume 37, No. 1, Spring 2013, pp. 6-9. The second, "Liu Hsi-heng: Memories of a Taiji Sage", was first published in the Journal of Asian Martial Arts, Volume 19, No. 2, pp. 72-107, and it was subsequently included in the anthology entitled Cheng Man-ch'ing and T'ai Chi: Echos in the Hall of Happiness, Via Media Publishing, 2015. Moreover, Martin Inn, of the Inner Research Institute, compiled and published DVDs of Mr. Lo's lectures on the T'ai Chi Classics (The Lectures, with Benjamin Pang Jeng Lo: Commentaries on The Essence of T'ai Chi Ch'uan, IRI Press, 2010). He also persuaded Ben to allow him to publish invaluable footage of Mr. Lo demonstrating the solo exercise and double-edged sword forms (Benjamin Pang Jeng Lo: Enduring Legacy of Professor Cheng Man Ch'ing, IRI Press, 2016). These are priceless treasures for all who study the art of T'ai-chi Ch'uan. Those of us who knew him will never forget him. May he rest in peace, and may his memory be honored with deepest respect. *Taken from the Facebook Page Taiijquan “One Family” Mission. Posted by Matt Stampe on Nov 8th, 2018. One form to rule them all? In the world of martial arts there are many many many styles! Too many for most to learn all of them - not to mention master them all. Even when you narrow your focus on one discipline (Karate, Wing Chun, Hung Gar..etc), you’ll find many styles with in that discipline. Furthermore - you’ll find many Forms within each style/family! Take taijiquan for example. There’s Yang, Chen, WuDangShan, WuHao, Sun…and more and more. Within each of those, you’ll find long Forms, short Forms, paired Forms, weapons Forms, paired weapons Forms - etc. It’s enough to make your head spin. As always, Facebook is a great place for great thinkers to debate about the things they are all experts on. So, we thought we’d bring you food for thought at the beginning of this new year - using a Facebook discussion. In the Black Bamboo school, we have many forms. We have one taiji long Form, Liehubafa (another internal Form), Tangquan (a hard style empty hand Form) as well as many weapons Forms and push hands paired Forms or drills. We invite you to consider - why? What is the value (if any) of multiple Forms. If you’ve learned more than one Form, what is your take. If you’ve stuck with one Form, what has been your reasoning. Please join the discussion in the comments below. Or bring your thoughts to class! Chen Zijiang is performing a 5 star routine here; a perfect, seamless flow of Fundamentals, Form, and Function! If you've talked to anyone about your taijiquan practice and used the term "taiji", you might have gotten confused looks. When you say "Tai Chi" your conversation partner's face clears up and they suddenly know that you're talking about old people waving their arms around in parks! This confusion happens more frequently when sending emails, texts - and especially on one of our most popular venues - Facebook!! This cross communication happens because there are two Chinese transliteration systems - Wade Giles and pinyin. The Wade Giles system was the original system and many Americans learned to recognize Chinese words and concepts through that system. In later year, pinyin has taken it's place and is now the preferred system. Below is a cut and paste of a recent conversation on The Facebook. I've taken screen shots for those not able to enjoy these kinds of debates because of lack of access. It is also possible that this link might take you to this thread. We can cover this ground more in depth in classes but it would be educational for you to glance over the comment thread below. You'll see an extended explanation from LaoMa within this thread. Take a second an leave your thoughts on this debate in the comments section below. Below is an excerpt of a letter from a long distance senior student sister. This is in the context of responding to an older post on Student Corner: The devil's in the details. This post involved Wing Chun hand positions. You can view it by clicking here for a refresher. This student studies with other teachers in her area. Sometimes it can be challenging to reconcile two different systems. Recently, I was told to try to just move my hand rather than to move my body to execute a certain drill. The point of the drill, I think, was to experiment with certain rotations of the hands, which are useful for seeing the spiraling movements, but I am always trying to have the body make the hand move, remembering Master Jou saying, "Arms have no movement," in the last workshop I attended with him and your principle of whole-body movement. Probably because I have finally broken though in the movement of the hip joints, I think, I am especially focused on this. Two things, in particular, have come out of my working on this: I understand now why you told me that I need to be 80/20 in Roll Back rather than going to 100/0 and what being 50/50 in Cloud Hands means. In one of the taiji books I read, there was an anecdote about Cheng Man-ching standing in front of his desk and moving; not wanting to interrupt him, the person who told this anecdote waited for a while then finally interrupted him and asked what he was doing. The name he gave was Constant Bear, and Cheng said that it was all you need for taiji practice. I believe that movement was what we call Bear Swings through the Woods (and Wags Its Tail). I first began to work on this in the cane form when I found it difficult to move from one posture to the next in some places because I had weight on the foot I needed to pick up, and through some experimentation and a return to the Four Flowers, I began to see what I was doing wrong. I am still working on this, of course, but I'm starting to have the sensation of riding a wave when things are going well!